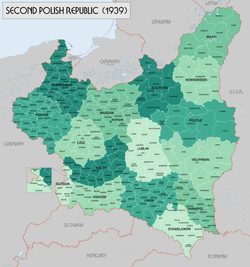 Administrative division of Second Polish Republic, 1930. Colors denote voivodeships, division into powiats visible on the lower level. Administrative division of the Second Polish Republic became an issue immediately after Poland regained independence in the aftermath of the First World War, 1918. Poland had been partitioned in the late 18th century, and various parts of new Polish territory had belonged to different administrative structures of Austrian Empire, Imperial Germany and Russian Empire. In 1919 the first voivodeships of interwar Poland were created; in addition the capital of Warsaw had a status of an independent city-voivodeship. In the years 1919–1921 additional voivodeships were created, as borders of Poland were still fluid, with events such as the Silesian Uprisings in the West and Polish-Soviet War in the East. Eventually by 1921 Poland would have 15 voivodeships, Warsaw capital city-voivodeship and the Autonomous Silesian Voivodeship (the system known as 15+1+1). Additionally, creation of the new Sandomierz Voivodeship was planned for late 1939. The lower level of administration, below voivodeships, were powiats (counties). They were subject to several reforms, particularly in early and late 1930s. Below them were gminas and gromadas. Shortly before the Second World War, in April 1939, Poland had 264 powiats, 611 urban and 3195 rural gminas and 40533 gromads. The division was based on the three tier system. On the lowest rung were the gminy, which were little more than local town and village governments. These were then grouped together into powiaty which were then arranged into województwa. On April 1, 1938, borders of several western Voivodeships changed considerably. For more information, see Territorial changes of Polish Voivodeships on April 1, 1938. Total number of Voivodeships - 16, plus the capital city of Warsaw, which was regarded as a separate unit. Łódź Voivodeship - pop. 2 650 100.
miasto stołeczne Warszawa (the capital city of Warsaw) - pop. 1 179 500. Total number of counties (as for August 1, 1939) - 264, including 23 urban counties. Kowel county (area 5 682 km²). city of Gniezno (area 18 km²). Katowice county, (pop. 357 300). Międzychód county, (pop. 31 000). Mały rocznik statystyczny 1939, Nakładem Głównego Urzędu Statystycznego, Warszawa 1939 (Concise Statistical Year-Book of Poland, Warsaw 1939). This page was last edited on 20 September 2017, at 18:32 (UTC).